Heart of Darkness is only the latest work from this multi-talented artist and Princeton is fortunate to hold many of Phillips’ other projects, books, and videos in its library collections. 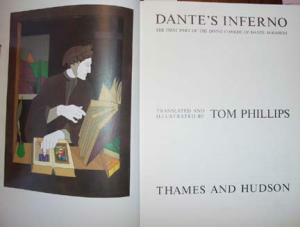 In particular, the 1985 trade edition of his Dante’s Inferno: The First Part of the Divine Comedy of Dante Alighieri. Phillips began illustrating and translating the Inferno in the late seventies, and published in a deluxe, limited edition in 1983. Demand was such that a trade edition was issue by Thames and Hudson two years later. Available in Rare Books and Special Collections, Graphic Arts division, GA Oversize PQ4315 .P45 1985q. Dante’s Inferno represents the first and most famous part of the Divine Comedy (1308-21) and tells the story of the three realms of the dead. It is full of the gruesome punishments meted out to the unfortunate souls sent to Hell—as observed by Dante as he travels through the circles of Hell with his guide, the Roman poet Virgil. It is one of the few undisputed masterpieces of European literature and Phillips’ reinterpretation is one of the most remarkable artist’s books of the twentieth century. Several years later, Phillips’ translation became the basis for A TV Dante (1989), a mini-series for the BBC, co-directed by Tom Phillips and Peter Greenaway. The series includes eight episode or the first eight cantos, up to the entrance to the city of Dis. The cast includes John Gielgud as Virgil, Bob Peck as Dante, Joanne Whalley as Beatrice. Historical commentary is provided by Ian Armstrong, David Attenborough, Jim Bolton, Nicholas Campion, and others. Available at the Language Resource Center (VIDL): Video Coll. East Pyne, VCASS 631. John Sloan (1871-1951). Hell Hole, 1917. Etching and aquatint, edition of 100. [Morse 186, second state (of 2)]. Printed by Peter Platt. 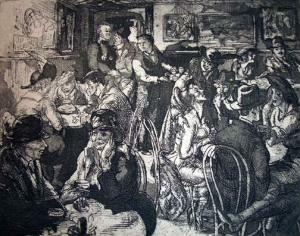 Exactly ninety years ago, John Sloan, Marcel Duchamp, and four others climbed to the top of Washington Square Arch and proclaimed it the “free and independent republic of Washington Square.” That same year Sloan immortalized the Golden Swan saloon, better known as the Hell Hole or the Bucket of Blood, in an etching; shown here. Not only was the artist a frequent visitor to the saloon, but his studio was directly across the street and his 11th floor window looked down on the life-size, gilded swan that hung over the front door. The Wallace he refers to was Thomas Wallace, the proprietor of the bar and a former prizefighter. The figure in the back right is playwright Eugene O’Neill, who, as Sloan documents, was a regular to the Golden Swan. O’Neill also memorializes the bar by using it as the setting for his play The Iceman Cometh. Today, the southeast corner of the intersection Fourth Street and Sixth Avenue has been transformed into a small park, known affectionately as the Golden Swan Park. 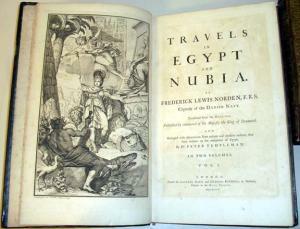 Norden's "Travels in Egypt and Nubia"
Frederick Lewis Norden (1708-1742). Travels in Egypt and Nubia. First English edition. Translated from the original and enlarged with observations from ancient and modern authors by Peter Templeman (1711-1769). 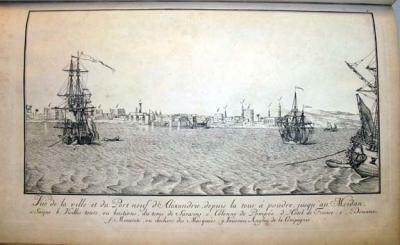 London: printed for Lockyer Davis and Charles Reymers, 1757. 159 full page engravings by Marcus Tuscher (1705-1751). Provenance: John Cleveland (1734-1817). Purchased with matching funds provided by Rare Books and Special Collections, Maps Division, Rare Books Division, and Graphic Arts Division. The Danish Naval Captain and explorer, Frederick Norden sailed to Egypt in 1737-38 to surveyed the architecture, agriculture, and other curiosities of the country. He was the first European to penetrate as far as Derr in Nubia, and produced the first coherent maps of the country. Seventeen years later, long after Norden’s death, his maps and drawings were published by the Royal Danish Academy of Sciences and Letters, under order of Frederick V of Denmark, as Voyage d’Egypte et de Nubie (1755). Two years later, the physician and naturalist Peter Templeman completed an English translation, which was published in two folio volumes. Thanks to the combined resources of the Maps Division, Rare Books Division, and Graphic Arts Division of Rare Books and Special Collections, Norden’s seminal work in now part of the Princeton University Library collection. Princeton Acquires William James Stillman's "Athens"
William James Stillman (1828-1901). Athens, ca. 1869. Portfolio containing 25 albumen prints, each approximately 7 ½ x 9 ½ inches (19.1 x 24.2 cm.) or the reverse, numbered sequentially in the negative (lacking no. 17), photographer’s initials and date in a few negatives; two trimmed with arched tops, mounted on card with printed title labels (some foxing to mount of plate 1, not affecting image) University College London, ink collection stamps (cancelled) on reverse of mounts; in original black morocco portfolio (rebacked and relined with ties replaced), titled and with photographer’s credit Photographed by W.J. Stillman in gilt on top flap, overall size 18 3/8 x 14 ½ inches (46.7 x 35.9 cm.). 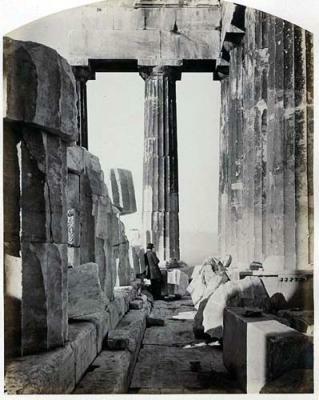 Thanks to the support of the Friends of the Princeton University Library, the Graphic Arts collection is fortunate to have acquired Athens, a rare nineteenth-century portfolio of albumen photographs focused on the Acropolis in Athens, Greece. This scarce work by the American diplomat, journalist and photographer, William Stillman, is the product of a tragic, but artistically rich period in his life. Following early careers as a painter associated with the Hudson River School and as founding editor of the art journal the Crayon, Stillman took up photography in 1859. Continuing as a journalist and travel writer abroad, Stillman put his skills as a photographer to use while serving as consul in Rome and Crete in the mid-1860s. Stillman moved to Athens in 1868, where his young son died and his wife committed suicide. 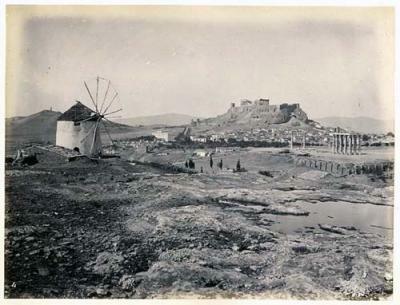 In response, Stillman devoted his life to his photography, executing this fine series of views of the Acropolis. A selection of 25 views from this series (with one small frontispiece image) was published in 1870 by the London firm, F. S. Ellis, printed in the carbon process by the Autotype Company. The title, as published, was The Acropolis of Athens: Illustrated Picturesquely and Architecturally in Photographs. This portfolio pre-dates the publication of Acropolis and represents Stillman’s earliest work in attempting to capture both the history and the beauty of Greek architecture. As opposed to the 1870 publication, which was printed by the Autotype Company, these images are printed by Stillman himself using wet-collodion-on-glass negatives developed onsite and then, contacted printed to albumen-coated paper. The photographs themselves are at once documents of a civilization past and sublime elegies in light and shadow. They begin with distant views showing the imposing nature of the Acropolis within its city surroundings, and move closer with dramatic and picturesque studies of individual structures and sculptural details. The photographs include several figures, one of whom is thought to be Stillman himself. See Andrew Szegedy-Maszak, “Athens. Photographed by W.J. Stillman,” Princeton University Library Chronicle, 70, no.3 (spring 2009): 399-432. 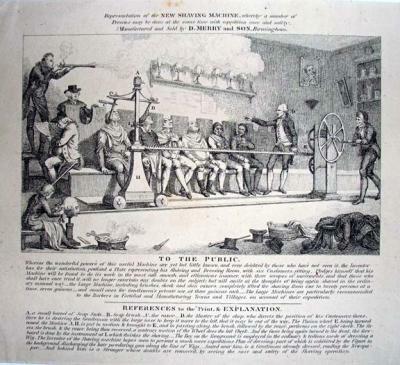 Unidentified British artist, Representation of the New Shaving Machine, Whereby a Number of Persons May be Done at the Same Time with Expedition Ease and Safety : Manufactured and Sold by D. Merry and Son, Birmingham. no date. Wood engraving. GA 2005.00992. H. The machine is put in motion & brought to “E” and in passing along, the brush, followed by the razor, performs on the right cheek. 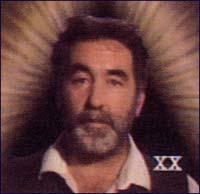 The faces, the brush, & the razor, being then reversed, a contrary motion of the Wheel does the left cheek. And the faces being again turned to the front, the forebeard is done by the instrument at “I”, which finishes the shaving. In the seventeenth and eighteenth centuries, “writing masters” would produce manuals of perfect calligraphic script that students would copy over and over until they had a perfect hand of their own. Often the masters would try to out-do each other with elaborate flourishes and decorative elements added to the standard alphabet. The engravers who produced these manuals were superb technicians, able to cut even the most complex italic curves with equal amounts of flamboyance and grace. Each of these volumes includes a complete alphabet, along with decorative grotesques and animal figures. 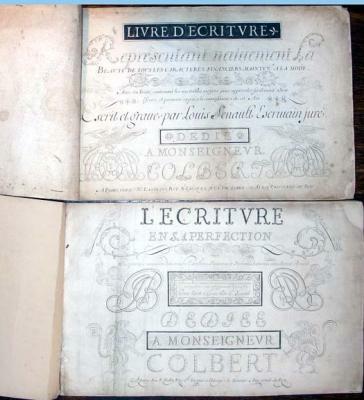 The second edition above gives particular emphasis to “Italian bastarde,” the hand used in French archival documents from the sixteenth to eighteenth centuries, notable for the characteristic wavy, free lines of the letters. Senault is also noted for producing a fully engraved and very decorative book of hours, first published around 1680, and also available at Princeton University.